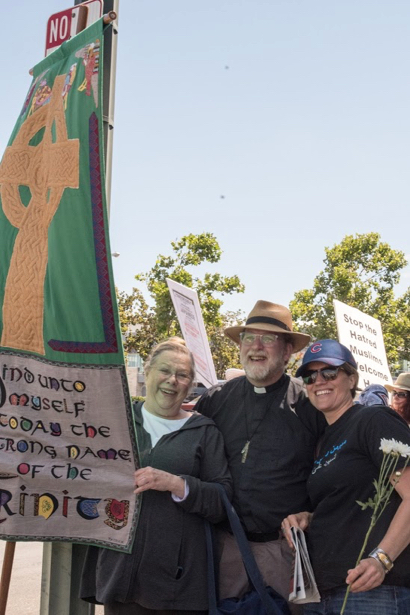 Members of Trinity Church in Menlo Park along with its rector, the Rev. Matthew Dutton-Gillett, participated in the Unity Rally this morning in Santa Clara. “We decided to co-host this rally in response to a rally that was sponsored by an organization recognized by the Southern Poverty Law Center as an anti-Muslim hate group,” said Matthew “In the end, at least 120 organizations joined the Unity Rally as co-hosts, coming from different walks of life and different faith traditions to stand up for what we believe are the dominant values of all our traditions and the larger community: to promote love and compassion. “It was a joy to arrive and see that the Unity Rally was at least twice the size of the rally that inspired us to action. There were no confrontations, just people expressing their hopes for our world. Absolutely wonderful! Thank you for representing us all!